For me bean dishes are all about cooking as you go. My friends are always asking me for the recipe for my bean dish. It’s never the same. It’s about what I have on hand. What I feel like. What will match the meal. Mexican pinto beans are a stable in my rotation though. Always good. Better than you’ll get at most restaurants. This recipe has lots of room for improvisation. As written, it’s rich. Savory. Pork, cilantro and green chili are the dominant flavours. Classic Mexican. Add some pure chili powder and it moves towards red chili territory. Want it bright and assertive? Add lime juice and chipotle puree. Want it lighter? Leave out the pork. Want it vegetarian? Leave out the bacon too. 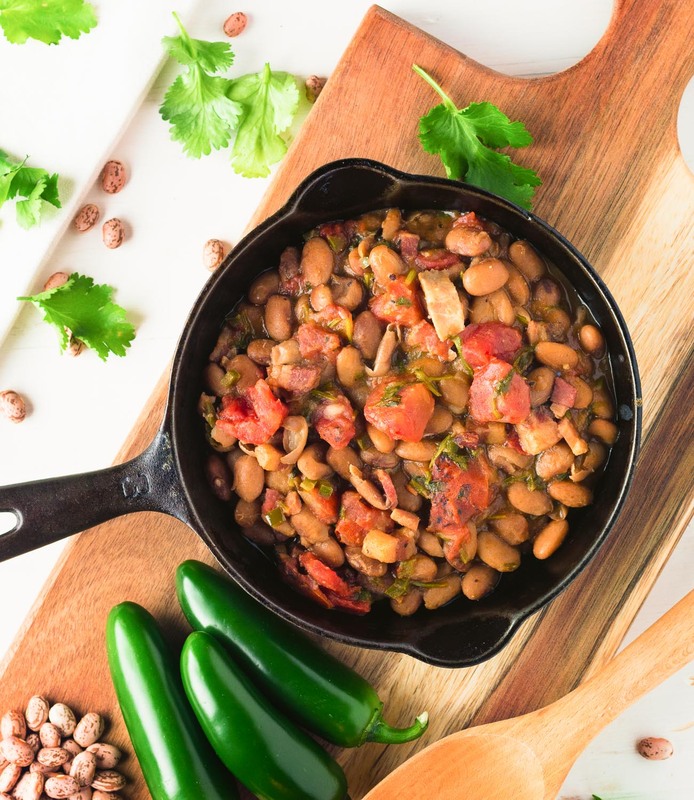 No time to cook dry beans – use canned. Beans are a canvas – waiting for you to paint them with the flavours you love. I use salt pork in this recipe. Out of the box it’s way too salty. You need to blanch it a couple times to extract most of the salt. 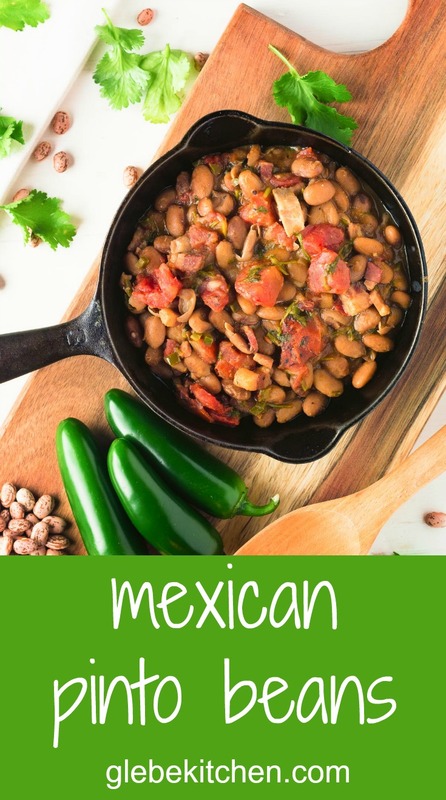 This recipe is based on a recipe from Diana Kennedy’s The Cuisine’s of Mexico. Her recipe uses pork rind but that’s harder to come by where I live. I’ve found the salt pork, once de-salted, to work very well. These Mexican pinto beans are better than you will get in restaurants. Rich, savoury and oh so satisfying, they go with anything and everything. Slice the salt pork into 1/4 inch slices. Place pork in a small saucepan of cool water and bring to a simmer. Cut salt pork into 1/4 cubes. Combine onion, pork and garlic with 6 cups of water and simmer, covered, until beans are tender - about 90 minutes. Add water as needed. You want to wind up with a bit of water in the beans but not so much you need to drain them (you don't want to lose all the flavour in the liquid). Worst case, drain the beans into a bowl and reduce the cooking liquid. Heat 1 Tbsp of vegetable oil or pork lard if you have it in a frying pan over medium heat. Cook the bacon until lightly browned. Add the cumin powder and cook, stirring, for about 30 seconds. Now add the jalapeño and cook for another minute or two. Mix in the cilantro, tomatoes and Mexican oregano. Simmer for about 15-20 minutes. Add a bit of water if the mixture starts to get dry. Combine the tomato mixture with the cooked beans and simmer another 15 minutes. 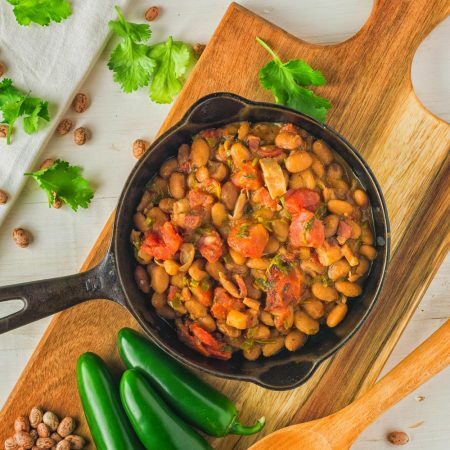 To adapt this recipe for pressure cookers, simply cook the pinto beans, onion, salt pork and garlic in the pressure cooker for as long as you would normally cook dry beans. There's salt in the pork and salt in the bacon so don't adjust seasoning until the end of the recipe. This looks so good, Romain! Pinto beans are my favourite 😉 love what you said about beans being like canvas, haha! There are so many things you can do with beans – I think that’s why I love them too. You can go anywhere with them. Alyssa – I hope your taste buds thank me too! Salt pork is usually in the meat counter at grocery stores around here. It’s not at all a rare ingredient. You really do have to blanch it though. It is wicked salty out of the package.